On 07/31/2018, Donna Goodsell pleaded no contest to one count of embezzlement of $1,000 to $20,000 which is a felony punishable by up to five years in prison. Goodsell's next scheduled court appearance is a restitution hearing on October 10, 2018. At that hearing, the court will calculate the amount of money that Goodsell must repay to the townships that she worked for. Sheriff Williams requests that citizens who purchased cemetery plots in the Evergreen Township, Day Township, or Bushnell Township cemeteries during 2012 to 2017 contact their township hall to verify that their transaction was properly documented. Montcalm County Sheriff’s Office conducted an ongoing investigation regarding embezzlement from Evergreen and Day Township after a complaint was filed regarding financial record inconsistencies. It was determined that the embezzlement occurred between 2012 and 2017. 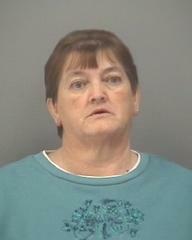 The investigation led to the arrest of a 60 year old Fenwick woman. The investigation revealed that Donna Mae Goodsell was employed by both townships to be the sexton of their cemeteries. Goodsell’s duties included the sale of plots, maintenance, opening and closing of graves sites, and contracting for the setting of headstone footings. Goodsell allegedly did not properly forwarding all of the funds she received from residents to the respective Townships. "Thankfully, there is no evidence that individual citizens were overcharged. While the township governments did not receive the payments, no individuals appear to be victims," said Sheriff Williams. Goodsell’s next court date is December 8th, 2017.